For many in the Fairfield community, the names Rishikesh and Jyotir Math bring broad smiles and deep feelings. Nestled in the foothills of the Himalayas with the majestic Ganges River flowing through, Rishikesh is the historic home to countless Rishis of the Vedic tradition and the gateway to the Valley of Saints and the mountain community of Uttar Kashi. Joshimath, known to the Fairfield community as Jyotir Math is the summer home of the Shankaracharya, the northern seat of Vedic knowledge. Badrinath, at 10,500 feet in the Himalayas is the easternmost of four sacred Hindu pilgrimages known as the Char Dham. It is the source of the Alakananda River which joins the Bhagirathi River at Devprayag about 3 hours north of Rishikesh. Marc Strauch had the good fortune to spend a month in these locations in March 2017 when he showcased five of his short films at the First Annual Rishikesh Art and Film Festival, gave four presentations on consciousness, storytelling, and film and won three awards - Best Narrative, Navaswan, Best Interpretative Divine Mother Reconstructed, and Best Experimental, P A R A : Unbounded Stillness In Motion. 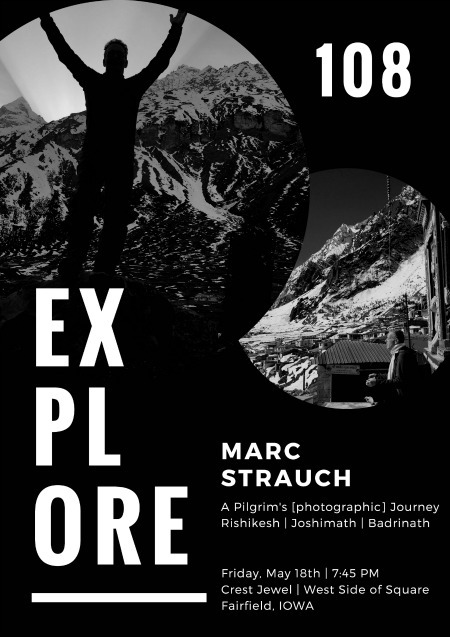 Join Marc as he photographically retraces his steps through this magical landscape of the mind, shares his experiences at the famed Beatles ashram on the banks of the Ganga and shows his short film P A R A : Unbounded Stillness In Motion. Friday, May 18th; 7:45 pm; Crest Jewel (west side of the square, Fairfield).